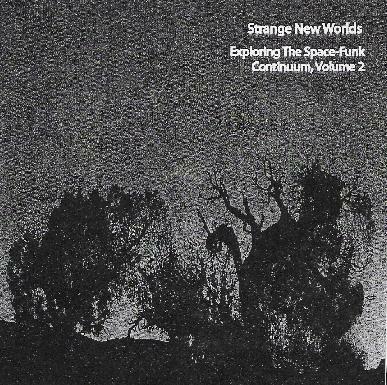 Strange New Worlds - "Exploring The Space-Funk Continuum, Volume 2"
Strange New Worlds is the all improvisational trio of Luke Palmer on keyboards, Eric Hoaglund on drums, and Evan Cantor on bass. Inspired by the likes of Pink Floyd, Miles Davis, Medeski, Martin & Wood, and Soft Machine, the band cover a range of jazz territory that can be standard at times, but at its best gets way off the beaten path. The CD opens with the 15+ minute "The Funkster", which starts off with a funky jazz groove plus spaced out alien synths and atmospherics. Now this is a combination I can get into. Soon the organ takes over and guest guitarist Nolan McFadden joins in and we're really jamming in full band mode. The music gets pretty fiery at times, with the guitar adding some nicely wah'd ripping licks, and trading leads with the keyboards while the bass and drums keep the funky foundation intact. "Black Sorceress" is an easy paced bluesy lounge jazz jam whose lifeforce comes from Palmer's eerie spacey keyboards. Man, I dig that sound. It really gives character to an otherwise basic groove. "Afshar's Experiment" is a cool jazz jam with guest Aaron DiVesta on saxophone. And once again we've got some really nifty keyboards, this time getting into Soft Machine territory. A very interesting mixture of traditional jazz stylings and outer space sounds. The last few tracks consist of music that is a bit more straightforward than the rest of the album but still includes hot playing from all. "Groove to the Moon" and "Ice On The Run" have DiVesta on sax again. And "Cool Soul" is a melodic soft jazz piece. Nice stuff but I favor the earlier tracks that get into more interesting and adventurous realms. For more information you can visit the Strange New Worlds Myspace site at: http://www.myspace.com/snwband. Lots of downloads can be found at: http://luqui.org/blog/category/music/strange-new-worlds.